Sheila Jane on Periscope. Thank you replay! It's March! But at the same time my brain is confused...what happened to the school year!? We've only had TWO snow days so far this year which I'm also loving. It means my last day is June 10th!!! What!! Fingers crossed for NO MORE SNOW DAYS because for the first time since I started working in this district we are getting out before the 20s of June. Only 5.5 more weeks until my third marathon! People, training for a marathon DURING the school year is PURE CRAZY!! Training in the summer is going to be a breeze compared to this! My ERIN CONDREN notebook to come!!! I have been literally stalking my planner via UPS tracking as it goes across the U.S. It started in California...literally as far as possible in the continental U.S. from little ole' me in CT! #LittleObsessed. Can. Not. Wait. Ekk!!!! To get organized!! I think of myself as a very organized person but the reality is I am organized CHAOS! Organize my binders so I can more easily pull them out without disrupting the rest of them (the picture on the left is them in transition - they used to all lay sideways). I put the top on top of the container and I put papers I need to sort in the binders and student work for the week on top. I also decided to use one container for storing picture books. I was using a little basket previously and it was OVERFLOWING. Now I use that little basket to store just the books I am using this week in my lessons. I used a third container for my shoes (Hmm...I think I'm the only one who has multiple EXTRA pairs of shoes at school lol). And I used the fourth container to store student break materials and prizes (coloring books, sticker books, and special pencils). I also FINALLY created my Teacher Tool Box Labels and added my Toolbox to my classroom. I'm not 100% satisfied with my labels and definitely NOT happy with the color but I won't be able to spray paint it until spring break which isn't until the end of April. I STILL have areas in my classroom and storage that are just a MESS (um I don't even know what is going on in that container!) and they drive me bonkers. So I ignore those spaces. See how I'm horrible at organization?? 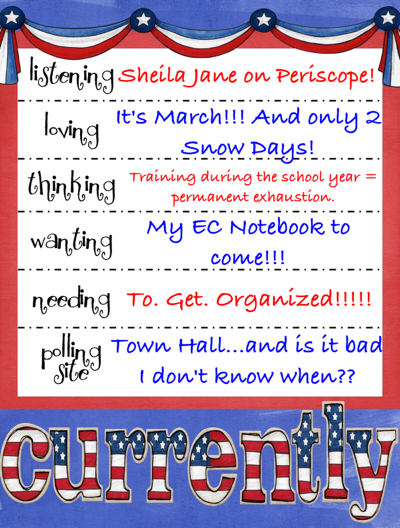 My elections all thankfully happen at the town hall and we haven't had our primary elections yet! Need some inspiration for the week ahead?